You may have graduated from light beer to an IPA, but the "power shower" is still awesome. You may have upgraded from light beer to an IPA, but the power shower—aka sipping a cold one while you lather—is still pretty much amazing. 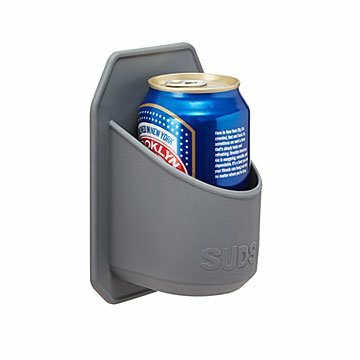 This innovative silicone design sticks to any glossy tile (or surface), and holds your beer while you clean up for the dinner party or a night out with friends. It's an upgrade from wedging cans in your caddy or placing them around the tub, which leaves them vulnerable to water splashes and slips. Keep it for yourself, or give it to a friend who gets the party started— and starts the party early. Made in China. Dishwasher safe. Allow to dry before reapplying surface. It is durable. Easy to clean. Item as described. Great product. Fun gift for any occasion for the beer drinker you love!! I was always drinking beers in the shower, but never had a good place to put them... UNTIL NOW! I was skeptical of the product's ability to just stick on the tile and not fall, but this thing is amazing. Worse case, my beer would fall I suppose, but it hasn't yet! Anyone who loves beer or even a Coca Cola would like it! I personally have not heard any negative reviews from my boss regarding the product. She did mention that the surface area should be clean before sticking the beer holder to it. My brother put this up on his glass shower wall and has a couple of beers after work. Works a treat! Slides straight off the wall as soon as you put a beer in it. Cheap and not worth the shipping to return. First time I've been disappointed with an Uncommon Good. Humorous gift for the beer drinker. I didn't take it out of it's packaging because this was being given to someone else. I have no idea if it will stick to the shower wall, but sometime gifts are meant to make someone laugh If its not used to hold a can of beer there are many items used in the shower for it to hold.